Divinity: Original Sin Turns a Single-Player Killfest Into Turn-Based, Group Combat. And Succeeds. Larian Studios' Divinity franchise has had an uneven past. The first game, Divine Divinity, was very good, but others have been more mixed. 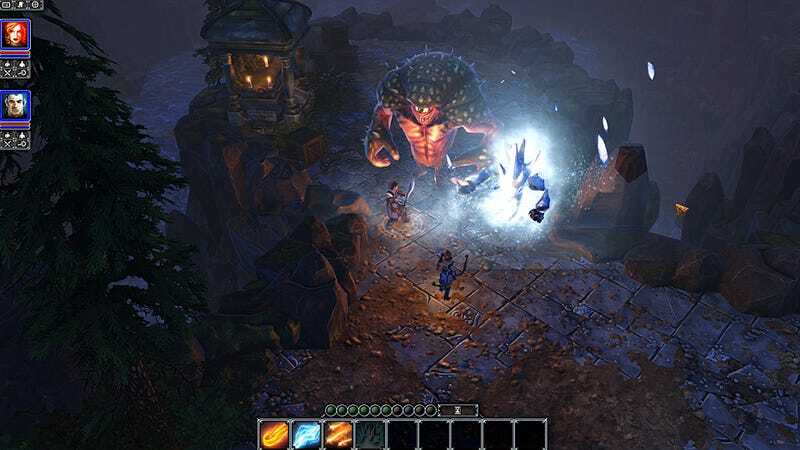 At E3 this year, Larian showed off two games set in the Divinity universe. One, Dragon Commander, is a real-time strategy game focusing on the dragon knight idea introduced in Divinity II. The other, Divinity: Original Sin, is a proper RPG. But for all that Original Sin looks to return to the franchise's RPG roots, there are key differences. Divine Divinity and the games that came after featured a Diablo-esque "click it until it's dead" kind of combat, to go along with their class-free leveling. Original Sin chooses to forgo the free-for-all killfest of its predecessors, instead opting for turn-based combat. And of course, for turn-based combat, you really need a party. And that's the other place where Original Sin deviates from the franchise's tried-and-true pattern: there are two player characters, not one, and they travel together at all times. The pairing of two characters—one male, one female, each with some kind of "dark secret" in their past for the story to uncover—worried me greatly. Larian has tried this once before, with Beyond Divinity. It did not go well. Larian head Sven Vincke grimaced when I mentioned Beyond Divinity, and acknowledged that the ideas hadn't worked well. This game, he promised, is different. And the studio has learned from the past. The duo are designed from the ground up for active co-op play, something much easier to achieve in 2012 than it was in 2004. Larian representatives played the demo scene with two employees both playing. After the demo, I asked Vincke how feasible it was to play Original Sin as a single player, and he clarified the ways that a solo player can navigate a game designed from the ground up for co-op. Players have, basically, three options. One is to set an AI personality for the partner not being played. If the AI is, say, hostile or aggressive, then the partner will tend toward those lines and actions. Another is to turn off party interaction, and have only the player-controlled character make all the decisions solo. And the last is to have one player choose lines and reactions for both characters. An AI- or human-controlled partner could make the game interesting in ways a player does not necessarily intend or expect. The two characters can disagree: about the tone to take, about an action, about whether or not to kill someone... when they disagree, the system basically conducts a behind-the-scenes roll to see whose opinion wins. In the scene we were shown, that had the effect of killing off a more-or-less innocent NPC who probably could have been quite helpful down the line. I'm enough of a control freak in my RPGs that I don't think I'll be letting anyone else, human or machine, steer my partner. Aside from dialogue and decisions, the two characters play off each other very well in the turn-based combat. And the third player in the combat is the environment. Are you in an area filled with water? Electricity spells will be very, very useful. Are you in an area filled with flammable things? Now would be a great time to knock out the entire room's worth of enemies with a well-placed flaming arrow. But do be careful where you stand. Friendly fire is enabled. Oops. Overall, the feel is much more tactical, strategic, and thoughtful than previous Divinity games have been. I kind of really liked "click it until it's dead" as a method of combat, but there's an elegance and efficiency in the turn-based system—not to mention the utility of having two characters' worth of skills and inventory—that I could see growing on me. The slightly off-kilter brand of Divinity humor remains intact, and in many ways that's the real heart of the series. For all that the previous three games have taken on stark, angels-and-demons levels of good and evil, they have always done so with a bit of a nod and a wink to the player. Not in such a strong way as to break the fourth wall or render their own gameplay unserious, but just enough to convey that everyone, from the designers to the characters, are in on the joke with you. Only in a Divinity dungeon have I seen a skeleton have an existential crisis and been able to make it stop thinking long enough for "I think, therefore I am" to stop working and let him crumble into harmless dust. Perhaps the biggest new feature in Original Sin, though, is the level editor. Divinity games have always been about exploring every single cranny of the world, and reward players well for doing so. Only now, the world is, well, infinite. Any player can create new levels, using the same scripting tool that Larian uses internally. The tool looks to be amazingly flexible, letting players create anything from scenic mountain passes to burning underground dungeons, and everything in between. As for a release date? Vincke said that they are aiming at a Q2 2013 for Original Sin, but that Larian's main goal, particularly in the light of some previous game releases, is to make sure the game is well and truly ready before it comes out, even if that means delays. A delayed game is always better than a buggy or incomplete one. I look forward to having a go at Original Sin whenever it's ready.